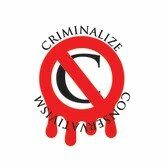 Criminalize Conservatism: Conservatives: "Out of Touch, Too Extreme." Conservatives: "Out of Touch, Too Extreme." Especially for those who watch MSNBC on a regular basis, the recent Pew Research Center poll gave many reasons to cheer earlier this month. We present the results from their poll and their take on their poll, "GOP Seen as Principled, But Out of Touch and Too Extreme, Images of the Parties: A Closer Look," with our comments and highlights for talking points in debating the Conservative Sheeplets, online or in person. The national survey by the Pew Research Center, conducted Feb. 13-18 among 1,504 adults, comes at a time when Republican leaders are debating the party’s future in the wake of Barack Obama’s reelection. The Republican Party’s image has been hit hard over the past decade. 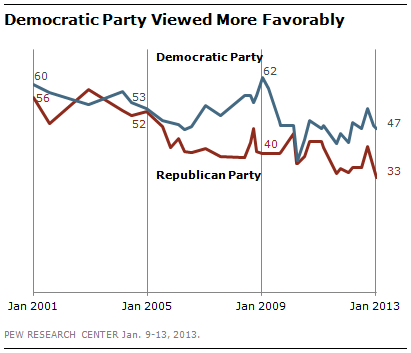 In January, just 33% said they viewed the party favorably, among the lowest marks of the last 20 years. 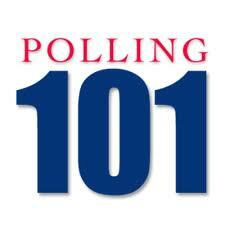 The GOP’s favorable rating has not been above 50% since shortly after George W. Bush’s reelection in 2004. 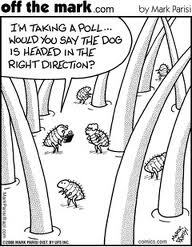 An earlier release from the survey by the Pew Research Center and USA TODAY found that while both party’s congressional leaders receive negative job ratings, just 25% approve of the job performance of GOP leaders, compared with 37% approval for Democratic congressional leaders. The new report finds that while the Democratic Party is viewed more positively on most traits tested, opinion is divided about whether the party is out of touch with the American people: 46% say it is, while 50% it is not. And only somewhat more say the Democratic Party is looking out for the country’s future than say that about the Republican Party (51% vs. 45%). Republicans are more critical of their party than Democrats are of theirs on most issues. For example, 36% of Republicans say the GOP is out of touch with the American people. Just 23% of Democrats say their party is out of touch. And while 30% of Republicans say their party is not open to change, just 10% of Democrats make the same criticism of their party. However, Republicans overwhelmingly credit their party for having strong principles; 85% say the GOP has strong principles while 13% say it does not. And 80% of Republicans say their party is looking out for the country’s long-term future. The GOP also gets high marks from independents and Democrats for having strong principles. Fully 62% of independents say the Republican Party has strong principles, the most positive measure for any party trait tested. 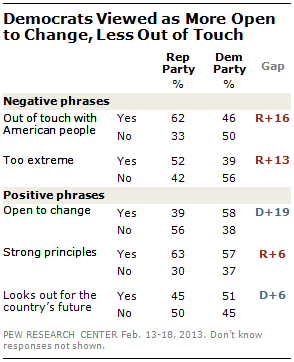 Even about half of Democrats (52%) say the Republican Party has strong principles. Partisan views about whether the Republican Party is too extreme are mirror images: 78% of Republicans say the GOP is not too extreme, while 19% say it is; 78% of Democrats view the Republican Party as too extreme while 19% disagree. Democrats express highly positive views of their party across-the-board, while Republicans’ opinions about the Democratic Party are uniformly negative. At least 80% of Democrats evaluate their party positively on every trait except one, being out of touch with the American people. Even there, 76% of Democrats say their party is not out of touch, while just 23% say it is. Far more independents say the Democratic Party is open to change than say that about the Republican Party (54% vs. 39%). The gap is roughly the same in independents’ views about whether the parties are out of touch (65% Republican vs. 51% Democratic) and too extreme (51% vs. 40%). However, independents are divided over whether the Democratic Party looks out for the country’s future: 45% say it does and 51% say it does not. Independents have similar views about whether the Republican Party looks out for the future (43% yes, 51% no). About a quarter of independents (27%) say that neither party is looking out for the country’s future. An even higher percentage of independents (37%) say that both parties are out of touch with the American people. The Republican Party’s overall image stands at one of the lowest points in nearly two decades. And, while impressions of the Democratic Party are much stronger, they are far below where they were four years ago. In January, 33% of the public had a favorable view of the GOP, compared with 58% who held an unfavorable impression of the party. Among Republicans themselves, 69% had a favorable impression, down from a recent high of 89% reported after the GOP convention. 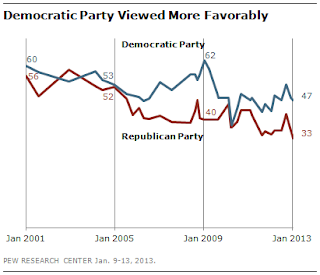 Majorities of both Democrats and independents viewed the Republican Party unfavorably (83% and 58%, respectively). Views of the Democratic Party were evenly divided in January: 47% favorable, 46% unfavorable. Among Democrats, 87% had a favorable impression of their party while roughly the same percentage of Republicans held an unfavorable view (84%). Independents, on balance, had more unfavorable impressions of the Democratic Party (52%) than favorable ones (37%). "The poll found that 62 percent of all Americans — including 36 percent of Republicans — think the party is out of touch. That's 16 points higher than the percentage of people who thought the same about Democrats. The GOP image is at its lowest point in nearly two decades. Exposing the criminality of the "vast right-wing criminal conspiracy" to the independent is a tall order, as they don't read the political sites on the web, and any outreach must be structured delicately so as not to alarm the moderate segment of the electorate. friendship. We'd never go into business, because we'd be cynical. Well, that's nonsense. You've got to jump off cliffs all the time and build your wings on the way down."